Halter founder and CEO, Craig Piggott out in the field working with the Hoop neck band and Helm app. Photo: Supplied by Halter. A young man from the South Waikato has found himself leading one of the most interesting advances in farming technology in recent years. 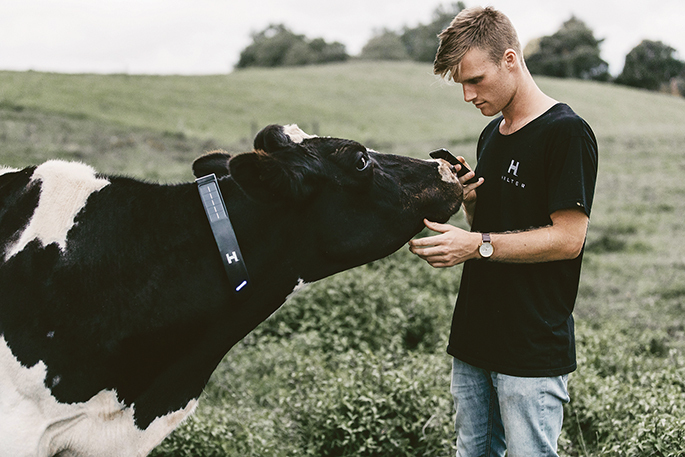 Craig Piggott, aged 23, is the founder CEO of Halter, an Auckland-based company that has developed ground-breaking technology to enable farmers to shift, manage and monitor their herd using an app. And in mid-June, Halter announced it has raised NZ$8M to commercialise its patented technologies. Craig was raised on dairy farms and studied mechanical engineering at Auckland University. He then worked with satellite launch company, Rocket Lab. The concept of Halter wasn’t a specific light bulb moment for Craig. Halter uses solar-powered, GPS-enabled neck bands on cows that emit audio cues to direct cows to stay within a predefined perimeter, or guide them to a location. It is controlled by the farmer using an app called Helm. The technology aims to remove the manual inefficiencies of drafting cows with dogs or bikes, and constantly shifting electric fences. It also monitors and records individual cow health-related data such as if a cow isn’t eating or sleeping; when it is calving and if it needs assistance; or if it is walking slower due to lameness. The farmer can then intervene at an early stage. Extensive trials and testing are carried out on the company’s working dairy farm in Morrinsville; and work is underway to begin operations on five pilot farms across the Waikato region. Halter is a privately-funded company, with backing from Rocket Lab CEO Peter Beck and Sir Stephen Tindall’s K1W1, Tuhua Ventures, and Promus Ventures – plus the recently-announced $8M. Craig says the new funding will allow them to scale up and meet the intense demand and pre-orders that are “rolling in”. The company employs close to 20 engineers, scientists and animal behaviour experts – and Craig says the funding boost will see the team grow four-fold. They hope to have the technology commercially available by the end of 2018. There is already healthy interest from Europe, Australia, the US and South America.